Every once in a while I am absolutely taken by an event designer's work. I discover their work and I'm like "whoa, I need to see more." And that's exactly what happened when I stumbled upon the work of Maxine Owens from The Southern Table! The gorgeous glimpses you’re about to see, inspire me to no end. I just love the way that Maxine uses color in her work and it's absolutely clear that she knows a thing or two about what makes for beautiful imagery. 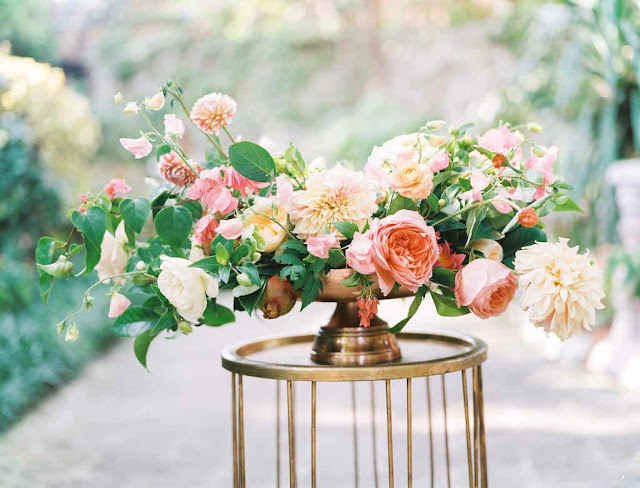 For example, in this first styled shoot, The Southern Table and Events By Kristin wisks us up, up, and away to a romantic, garden scene where we are instantly hit by the gorgeousness of it all. Petals dance across tables in the happiest hues, courtesy of The Southern Table and these captures by Ben Q. Photography? Be still my heart. The Southern Table does it again! Overcast skies and rich, sultry color that will pops in the prettiest way possible? Marrying easy elegance with stunning props a la Found Vintage Rentals, this seaside styled shoot is stunning to say the least. The overall results are guaranteed gorgeous with Charla Storey Photography behind the lens and the lovely lineup? Well, it's sure to inspire you to say the least! From the Designer, Maxine Owens of The Southern Table "Our weather proved to be a little less sunny than we’d hoped, so we decided on a more moody color palette." "We chose greys, deep blues, and pops of burgundy to pair with muted yellows, soft peaches, and pinks. The overcast skies set the backdrop for the ocean-side gathering." "Taking inspiration from the natural rock formations and wood tones our team conceptualized an intimate outdoor dinner with breathtaking views of the landscape at dusk." "The table scape was set with romantic candlelight and clear glass vessels to enhance the reclaimed wooden table from Found Rentals. Here, we selected delicate café au lait dahlias, hellebores, anemone, amaranthus and soft garden roses to accent the slate and ocean tones." "Charla Storey Photography perfectly captured our sea side model nestled in the sand with her piercing blue eyes accented by makeup artist Karina Fonti and hairstylist Nicholas Cole. The Dress Theory provided this romantic and effortless Sarah Seven gown that mimics the waves rolling against the beach. Wendy Kay of Birds of a Feather Events helped pull all the details together for this wedding in just 44 days, and the result was as lovely as it was meaningful! But would you expect anything less if I told you that The Southern Table did the floral design and Charla Storey was there to capture every pretty detail? This color palette! Those place settings! This couldn’t be more perfect, if you ask me! With a mix of simple white blooms and beautifully textured greens, I'm just so in love with the way that Maxine Owens of The Southern Table this bouquet was tied with hand-dyed indigo ribbons! Join me in giving this floral designer a little bit of love by sharing this post with a tweet, a pin, or a facebook share! No Comment to " Featured Floral Designer + Event Stylist: The Southern Table "